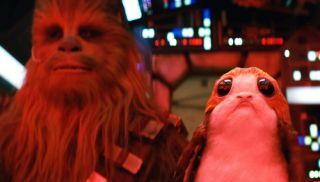 The latest Star Wars movies have been among the most hotly-anticipated films of all time, and that means there are plenty of people who could profit from finding out their secrets ahead of release. And that in turn means some pretty drastic measures have had to be taken in order to keep the details of their scripts from leaking, right down to the tech used to write and share them. Star Wars: The Last Jedi director Rian Johnson revealed the extreme lengths taken to keep his script from being seen, even as it was being written. “I typed Episode VIII out on a MacBook Air. For security it was 'air-gapped' –never connected to the internet,“ he told the WSJ. It's been a similar story on the set of the forthcoming Han Solo standalone movie. Actor Woody Harrelson was shocked at the amount of secrecy he had to adhere to, and the tech wizardry to keep all those secrets safe. Whether it was an iPad or a Kindle, Harrelson wouldn't – or couldn't – say. So, if you want to get involved with a galaxy far, far away, take note – you may have to be prepared for some Jedi Mind tricks courtesy of the Disney IT department.